Why is diversity so important and what role does diversity play in discovery, problem solving, adaptability, and robustness? This accessible two-day executive education course provides an intensive introduction to the functions of diversity in complex systems. 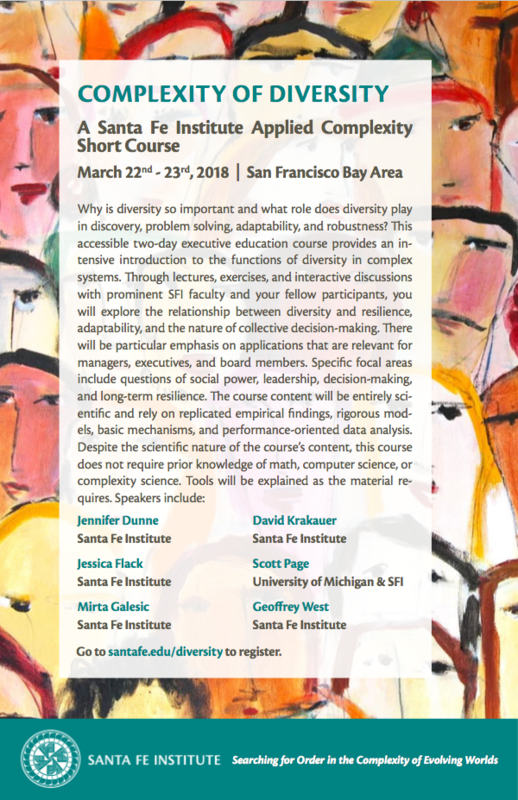 Through lectures, exercises, and interactive discussions with prominent SFI faculty and your fellow participants, you will explore the relationship between diversity and resilience, adaptability, and the nature of collective decision-making. There will be particular emphasis on applications that are relevant for managers, executives, and board members. Specific focal areas include questions of social power, leadership, decision-making, and long-term resilience. The course content will be entirely scientific and rely on replicated empirical findings, rigorous models, basic mechanisms, and performance-oriented data analysis. Despite the scientific nature of the course’s content, this course does not require prior knowledge of math, computer science, or complexity science. Tools will be explained as the material requires. Click on thumbnail for details.